It’s been rumored, spied, and teased for years, and finally Land Rover gave us a good look and solid first drive at its Range Rover Evoque Convertible shortly after its South African launch. We’ve known for a while now that Range Rover was working on a convertible SUV based on the Evoque as they first revealed the concept version in 2012, and since then, talk of a production version has drawn both criticism and enthusiasm from the automotive community. As we can see, the final design closely matches the styling of the regular Evoque, just without the fixed roof and pillars. Technics aside, lets get to our First Drive comments. On the outside, the Evoque Convertible may not quite have the “stately home on wheels” gravitas of its fuller sibling, but it’s still a handsome beast. While if you want true sportiness with the same badge you’ll probably look to the standard Evoque, the convertible feels more childish and certainly fun to drive. It’s also very dependent on what color and wheels you pick. In our metallic paint – Land Rover calls it “Corris Grey” – and the simple 20-inch wheels it’s the epitome of a Free State farmer’s housewife field-to-theater chariot; pick a bolder colour and slap some beefier wheels on, however, and you have the perfect accessory for your next rap video (we’re praying for this). Inside, it’s well-constructed but doesn’t feel especially large, a side-effect of the sloping dashboard and the sizable center console. Range Rover does at least make good use of the latter with a cooled compartment to keep your ice cream from melting when you leave the store. The front seats – upgraded with active cooling and 12-way power adjustment, as part of the Front Climate Comfort & Visibility Package, that also adds heated rear seats, Xenon headlamps with auto high-beam, blind spot monitoring, and more – are throne-like, supportive, and comfortable, while the rear has decent legroom. Forget fitting anything larger than children into that row, though, and don’t be misled by the SUV’s overall size into thinking it’s a vast cargo hauler. It isn’t vast. What you do get is a fair amount of gadgetry. Land Rover had kindly ticked the upgrade box with a Meridian audio system, replacing the – hardly lackluster – standard install. It also gets you active cruise control with the ability to do low-speed traffic follow in urban congestion: there’s also the Driver Assistance Package with its lane-departure, traffic sign recognition, park-assist, head-up display, and 360-degree bird’s eye view camera. I’d say the latter is a must-have. 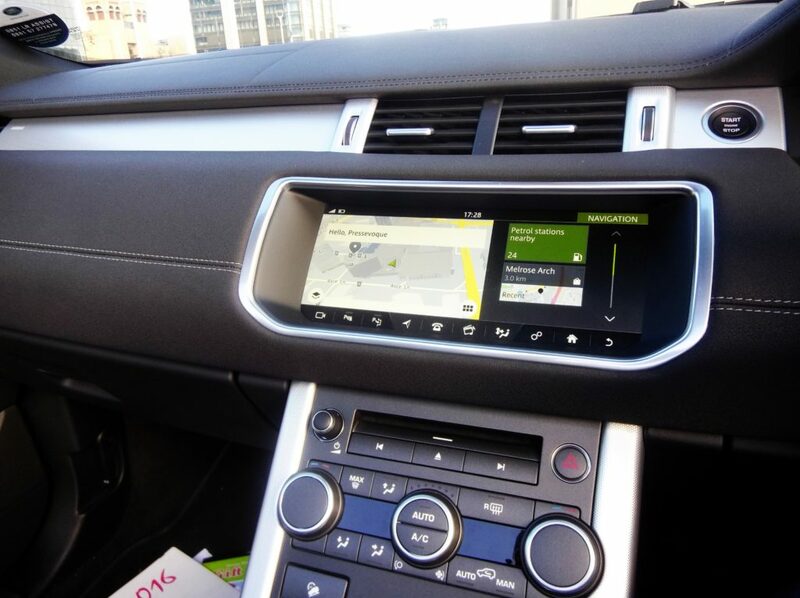 Standard is the dual-zone climate control, Bluetooth, and Jaguar Land Rover’s InControl infotainment system. The very same we saw in the F-Pace earlier this year. We couldn’t help but notice how responsive this is. Well done to JLR on this. There are plenty of physical controls for those who prefer to rely on muscle memory. Sadly CarPlay and Android Auto are not yet available on this model either. The electric window switches are oddly placed too far forward on the doors, but the HVAC dials are all easily adjusted. Some of the switchgear on the steering wheel feels a little flimsy. 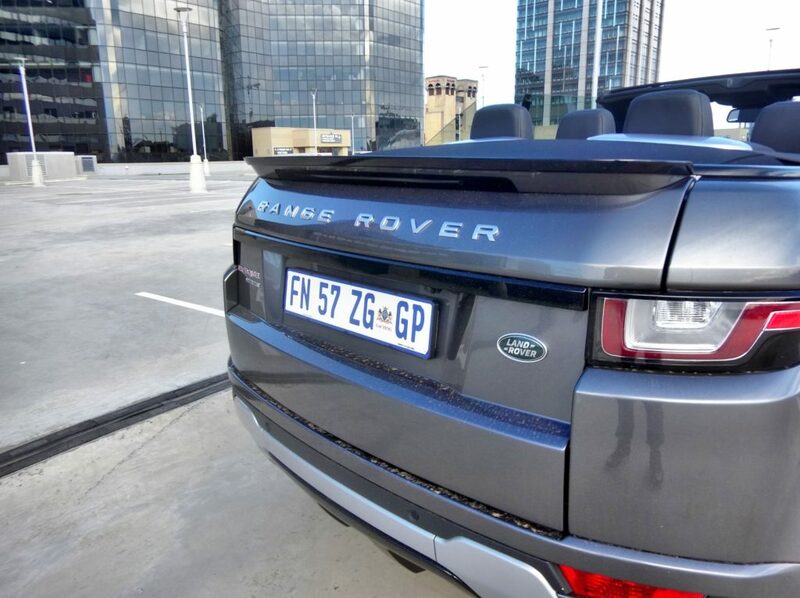 As for the engine, Jaguar Land Rover kitted our review unit with a 2.0-liter petrol under the the Range Rover Evoque hood, and while the 176.5/240 kW/PS may not sound like much, the 340 Nm of torque is plenty. The big, small SUV isn’t slow to wield it, either: stab the accelerator and the 9-speed automatic quickly drops a few cogs and the whole thing surges forward. Land Rover says it’ll do 0-100 km/h in 8.6 seconds, not bad for something that weighs just over 2000-kg, though it’s hardly the most harmonious experience for your ears. Just make sure its in Sport mode. All the same, don’t let the “Sport” in the name fool you into thinking this is a faux-off-roader: the Range Rover has serious abilities. Still, the engineers have done a decent job keeping the tented cabin quiet, even when the auto stop-start cuts the engine at the lights. Freeway cruising is no problem, though overtaking in the 100-120km/h range does provoke some frenzy in the transmission as the engine hunts for its sweet-spot. The height adjustable air suspension keeps things level while you do it, however. 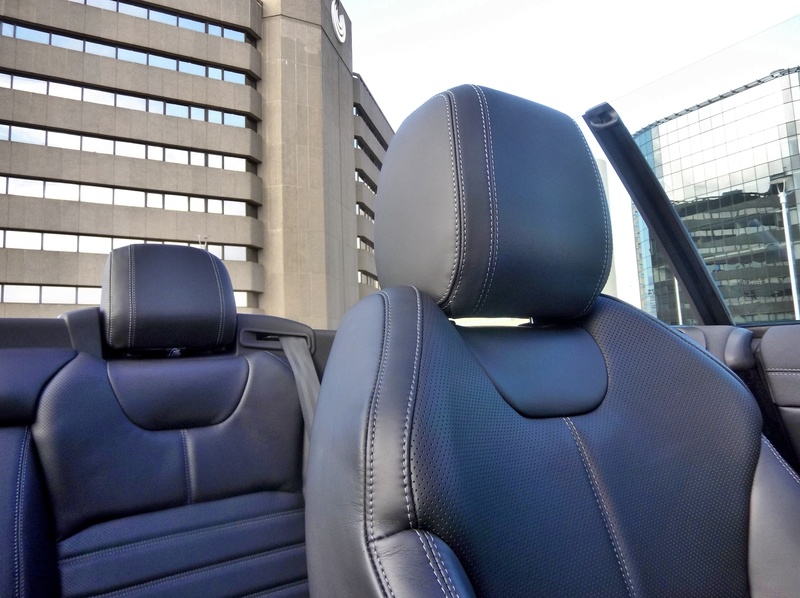 To sweeten the deal, its soft top opens in just under 8 seconds from our tests, but requires you to drive at 50km/h. It’s also part of the Range Rover Evoque Convertible’s big sales message: this may feel like a luxury SUV, but it can go off-road with the best of them. Full-time all-wheel drive, independent suspension at the front and rear, Torsen differential, and Land Rover’s well-esteemed Terrain Response System with its various modes for snow, mud, and sand are all standard. I confess, my time off-road was minimal, but that did give me a chance to test the petrol’s economy. The EPA says you’ll see 8.6l/100km combined, 11.4l/100km in the city, and 7.0l/100km on the highway; in my own mixed driving, I got more than 530km from a full tank (68.5 litres). If you dislike stopping at fuel stations but enjoy torque, the Range Rover Evoque Convertible may be the SUV for you. Your decision, therefore, probably comes down to self perception: are you a minimalistic Scandinavian, a technocratic German, or a distant relative of Her Majesty? 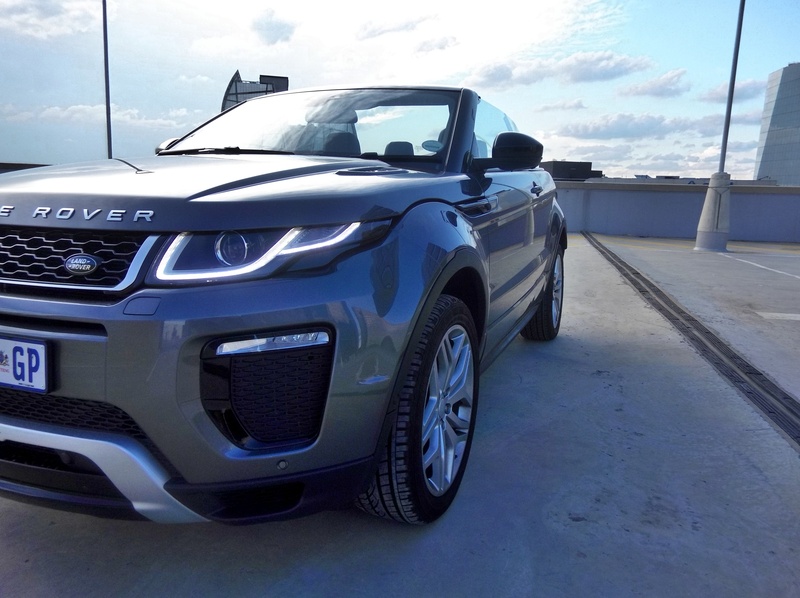 The 2016 Range Rover Evoque Convertible certainly has the image and the performance that royalty demand, you just may have to pawn the family jewels to afford it. Bonus? 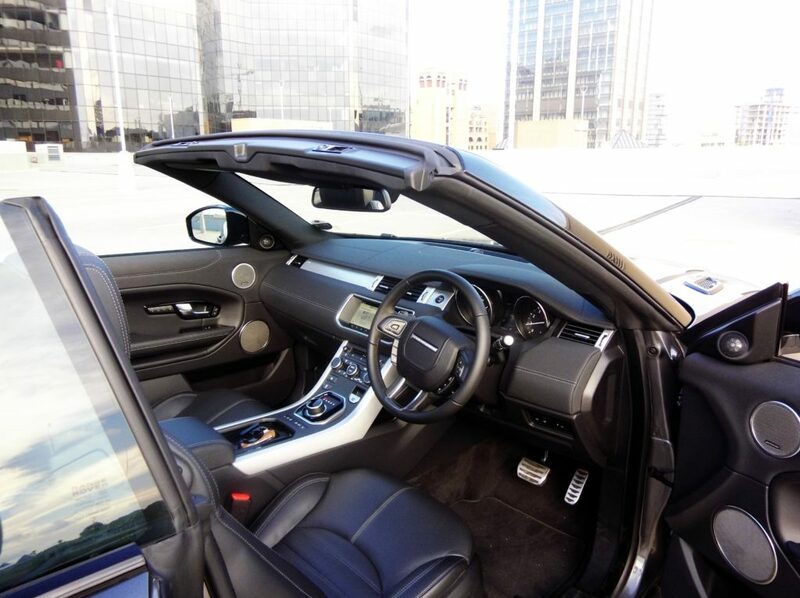 Everyone’s jaw will drop as you drive pass in your brand new Evoque Convertible. Its definitely on our Christmas wish list.